David Watkins, the founding father and cornerstone of Watkins Insurance Group, got his start at the R.B. Lewis Agency, which was established in 1949. The agency sold mortgages, but Mr. Watkins offered insurance and he soon became known for it. In 1965, a new partnership—the Lewis-Watkins-Farmer Agency—was formed. In 1985 David Watkins became the sole owner of the new Watkins Insurance Group. 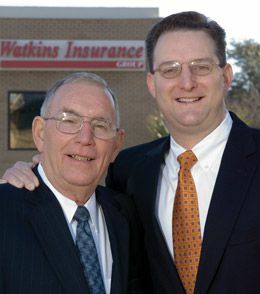 Mr. Watkins’ son Patrick started doing odd jobs at Watkins Insurance Group when he was in his early teens. After attending college at Texas A&M, Patrick joined the agency full-time in 1994, when Watkins had three full-time and two part-time employees working out of a converted house on Koenig Lane. Neighbors and passersby fondly remember Mr. Watkins on the front porch of the small office, talking and smiling to folks who happened by. Patrick Watkins officially became president of Watkins Insurance Group in 2002, after years of experience and training at the hands of Mr. Watkins, who maintained his friendly presence and role as “Chief Morale Officer” for years after stepping down from his official capacity as president. Unfortunately, Mr. Watkins passed away in 2009, but his friendly, caring nature embodies everything we are today. Patrick Watkins and our other shareholders—Rodney Watkins, Matt Womack, Sheila Noxon, Andy Webb, Hanna Ogle, Gregory J. Meserole, W. Scott McGuire and Brent Howell — have worked hard to establish lasting relationships with top insurance carriers and our clients. Since 1994, we have grown from five employees to over 100 employees in four Texas locations. Patrick Watkins is a past president of the Independent Insurance Agent of Texas, and many Watkins Insurance Group shareholders and staff also have earned highly visible positions and roles in the industry and community organizations. We are proud to have been named as one of the Austin American-Statesman’s Top Workplaces in 2011, 2012, 2013, 2014, 2015, 2016, 2017, and 2018. Since 1949, Watkins Insurance Group has been caring for our clients’ needs by putting their interests first. As an independent insurance agency, we can serve our clients better by offering a wide range of products, services and expertise with no bias toward one carrier or one product. Instead, we analyze your insurance needs and develop a risk management plan that includes insurance as well as a variety of risk management techniques to help you mitigate the risks you face and protect your assets. With Watkins Insurance Group, you’ll get more than just an insurance agent; you’ll receive valuable advice and access to products and solutions from a skilled and trusted advisor.